John McAllister from Ballymena has worked as a kennel boy, a bookie's clerk and an accountant. He studied creative writing at Trinity College Dublin, and has been the writer in residence for various council areas. 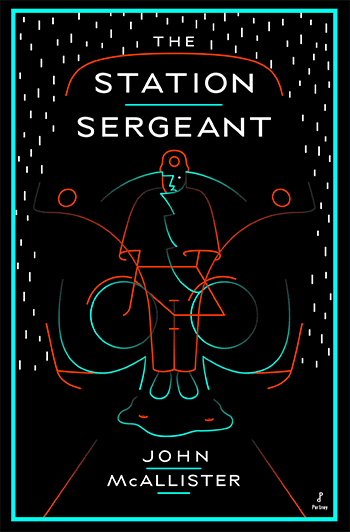 The Station Sergeant (2013), the first book in his "Barlow" series, is set in a small Northern Irish community in late 1959 and early 1960. A local farmer is found dead, a local criminal family is stealing cattle to order, a traumatised German soldier has escape into the countryside, there's a new DI at the station, and Sergeant John Barlow's comfortable life is about to be turned upside down. "People kept contacting me about The Fly Pool, and always they wanted to talk about the Barlow stories and the memories they invoked of their own childhood. On top of that, one of my best friends – an ex-IRA internee who makes the shape of the cross with his fingers if I even mention the Royal Ulster Constabulary – kept nagging at me for another Barlow story. "Way back I had started a sixth Barlow story but never finished it. To please my friend I picked it up again and what was supposed to be a short story got completely out of hand." The second book Barlow by the Book is due out in July 2015. A brawl among youths escalates into a series of violent robberies; a pickpocket targets leading businessmen; a local hood is on the run and suspected of several murders; and the town drunk, Sergeant Barlow’s friend and wartime commander, Major Edward Adair, must be sobered up in time for his sister’s visit. Barlow’s problems mount when his wife is released from a mental institution, his daughter Vera is shot during a robbery, his house is bombed and he is suspended from duty on suspicion of perverting the course of justice. McAllister's previous publications include The Fly Pool and Other Stories (2003) and the novel Line of Flight (2006). He also contributed to the anthology Requiems for the Departed.